It's time to digest the lessons of Haiti and Ebola and get ready for the mega disasters ahead. When the 2010 earthquake in Haiti proved too much for the United Nations’ humanitarian aid workers, the U.S. government took over, mounting a relief operation that was ultimately deemed fairly successful. But six years after that response, the federal government has yet to fully institutionalize the lessons it gleaned, or fund the capabilities that will allow it to handle the next mega disaster. As the scale of the devastation in Haiti came to light, the U.S. augmented its civil relief agencies with military forces. That operation — and the ones that followed in Nepal, the Philippines, West Africa, and Japan — taught the civilians that American troops could be of enormous use in such work. “There’s been quite a change over the last decade with respect to accepting the military’s role in responding to large-scale disasters,” said Mark Bartolini, a former head of USAID’s Office of Foreign Disaster Assistance, or OFDA. The groups also recognized the need to develop better, formal ways of working together, and so formalized the civil-military relationship in a June 2015 policy update. “We have further elaborated a system for that structural relationship between USAID and DOD as the lead agency for responding to international disasters,” said Beth Cole, a former head of USAID’s Office of Civil-Military Cooperation. USAID officials are now tasked to different combatant commands, and can quickly respond in a crisis. Civilians and military officials also take part in more regular disaster-response training programs. This paper summarizes the discussion and recommendations arising out of a workshop organized by the Center for Strategic and International Studies (CSIS) and the Observer Research Foundation (ORF) in Honolulu, Hawaii, on June 27, 2015. 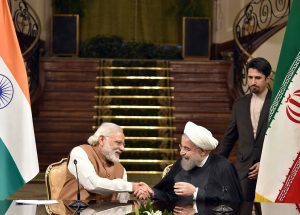 The workshop included officials from the governments of India and the United States, though the views are not considered “official policy” by either government. The paper presents both governments with a possible path forward to strengthen cooperation on humanitarian assistance/disaster relief (HA/DR). Download PDF file of "Deepening India-U.S. Cooperation on Humanitarian Assistance and Disaster Relief..."
Humanity is on course for a population greater than 11 billion by the end of this century, according to the latest analysis from the UN’s population division. In a simple sense, population is the root cause of all sustainability issues. Clearly if there were no humans there would be no human impacts. Assuming you don’t wish to see the complete end of the human race – a desire that is shared by some deep green thinkers and Bond super-villians – then the issue is whether there is an optimal number of humans on the planet. Discussions on population growth often start with the work of Rev Thomas Robert Malthus whose An Essay on the Principle of Population published at the end of the 18th century is one of the seminal works of demography. Populations change in response to three driving factors: fertility – how many people are born; mortality – how many people die; and migration – how many people leave or enter the population. The Nepal earthquake of April 25 is the largest in the Himalayan region since the 1934 quake which measured 8.2 on the Richter scale and destroyed not only parts of central Nepal but also the plains of northern Bihar in India. Mahatma Gandhi, shaken by the Bihar tragedy, wrote in the Harijan that the earthquake was “providential retribution to India’s failure to eradicate untouchability”. Although this statement dismayed the rationalist in Jawaharlal Nehru, it was Rabindranath Tagore who dared Gandhi by sending a letter to the Harijan saying, “Physical catastrophes must have origin in physical facts”. When Tagore, always far ahead of his times, made this insightful statement, the science of earthquakes had not developed. It was only in the 1960s that plate tectonics explained the origin of earthquakes. A house in Sankhu, Nepal house that was already severely damaged in the April 25th earthquake, shakes as a new 7.4-magnitude earthquake hits on May 12, 2015. Nepal and the rest of the Himalayan region suffered another major earthquake today—a 7.3 magnitude quake that struck about halfway between Kathmandu and Mt. Everest, near the Chinese border. Early reports estimate that up to 1,000 people are injured, and at least 68 have been killed in both Nepal and India. The region, especially urban areas like Kathmandu and Chautara, had already been reeling from the devastation wrought by the 7.8 magnitude event that hit the country on April 25 and killed over 8,000 people. Hundreds of aftershocks—some as strong as 6.7 magnitude—have continued to hamper relief efforts and keep residents in a panicked state. This latest quake, however, is not an aftershock, but a brand new seismic event. According to the United States Geological Survey, today’s earthquake occurred 9.3 miles deep in the earth’s crust—the same depth as the April event. Cities and villages in the area have already felt six aftershocks, and the new quake created a whole new wave of landslides further north in the Himalayan mountains.